There’s no shortage of patriotism in Oklahoma, and practically every community has their own extravagant Fourth of July celebration. From festivals with live music, to firework shows over Grand Lake, to the best parades around, the Sooner State knows how to celebrate. Get ready to enjoy the perfect Fourth of July in Oklahoma! The festivities kick off at 6 p.m. with live entertainment. At 8:30 p.m., Dr. Irv Wagner's Concert Band will begin a patriotic concert honoring enlisted men and women and veterans. The fireworks display starts about 9:45 p.m. Food trucks will also be available! CNN and USA Today selected LibertyFest as one of the top 10 places to be in America on July 4. Oklahoma’s largest hometown parade kicks off at 9 a.m. on July 4 and the party goes on all day, culminating in the largest fireworks display in the OKC metro area. There will be lots of entertainment all day long, and the best bet is to check the website for times and locations of all events. Tulsa’s largest celebration is on the River Parks. The festival has tons of children’s activities at Veterans Park complete with Bad Wolf Ops Tactical Laser Tag, zip line, inflatables and games. Vendors will be on hand to provide food and beverages. When you’re watching the fireworks display, make sure to tune the radio to KRMG 102.3 FM to listen to an accompanying musical score that goes with the lights. 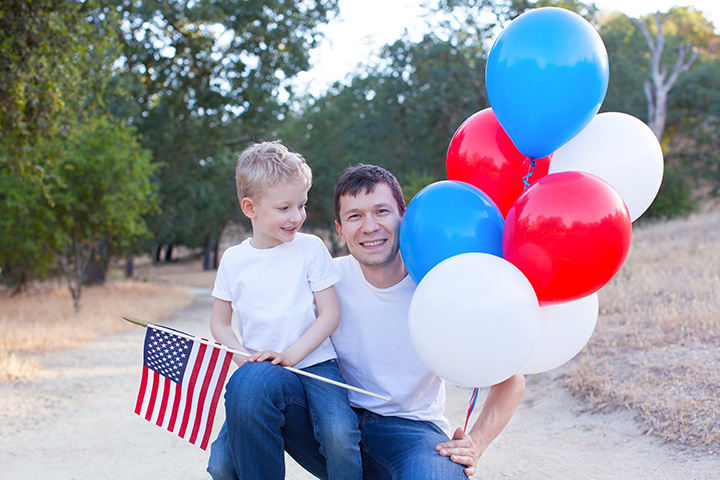 Historic Pawnee is a great place to enjoy an old-fashioned Fourth of July. Games on the square kicks off at 8 a.m. with turtle races, tug-of-war, sack races and more. The parade will wind through the downtown area around noon. The day concludes with fireworks at dusk at Pawnee Lake. This firework show is the longest running tradition on Grand Lake, dating all the way back to 1946. During the day, you can enjoy live music, food, vendors and swimming before the boat parade begins. The Oklahoma Air National Guard opens the show with a flyby of War Birds at 7 p.m. The event is held on July 4! The firework show starts at dark, but the party starts at around noon at Boomer Lake Park when the park will be closed to vehicular traffic. Food trucks and fun park activities for the whole family will be going on from noon on. Bring your lawn chairs and blankets to sit in the park or find seats at the Stillwater High School Pioneer Stadium so you can relax and watch the fireworks. Freedom Fest begins on July 3 and continues all day on July 4. The OKC Philharmonic, will be on hand, there’ll be a car show, parade, entertainers and free watermelon. A fireworks display starts at 10 p.m. each night. Bring lawn chairs or blankets to enjoy the fun. This year’s event is being held on June 30 starting at 10 a.m. The festival is free to the public, so you’re able to buy delicious treats offered by various food vendors! There will be live music and entertainment throughout the day, along with children’s activities and lots of fun to be had. At the end of the day, you can enjoy a wonderful fireworks celebration. Although Oklahoma City will be hosting many Fourth of July events around the metro, Bricktown is probably one of the best sites in area. Live music featuring a local DJ starts at 4 p.m. and goes on all night long, and the fireworks display at 9:45 p.m. The opening ceremony of the celebration is at the gazebo at 9:30 a.m. The city hosts Fourth of July races, tournaments, a balloon toss and $1 swimming all afternoon. There’ll be a parade in the morning, giveaways and a spectacular fireworks display at dusk. View more Oklahoma July 4th Fireworks and Celebrations.